Stage 1 involves an initial consultation with the Archaeologists Historians or other experts	and the Project Manager. An outline of the requirements is normally supplied by the Project Manager along with various photographic	and documentary resources. Occasionally the requirements can be modified, primarily to the advantage of the Project Manager as I can usually suggest a more effective proposal. For example, if views of a multiple-roomed building are required, I would suggest a cutaway showing all floors rather than the individual rooms. 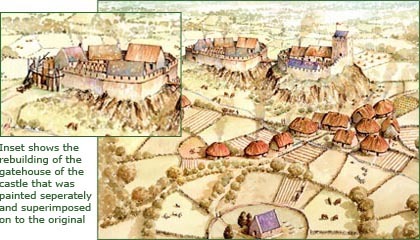 This was the case with Bagenal's Castle, Newry where one illustration was supplied instead of three separate views. Stage 2. I then carry out some personal research into the project using the resources provided by the experts, the Internet	and personal books and photographs. Stage 3 usually requires a personal visit to the	site. Not only does this give me a 'feel' for the place but also is an opportunity to gather both general and detailed information that cannot be provided by someone else's records. 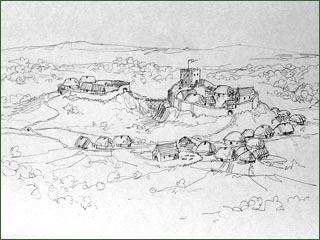 My own records include sketches, notes and comprehensive photographs of the site and its environment. Stage 4 is where I collate all this information and prepare a preliminary sketch proposal for each intended illustration. This is then forwarded to the expert and Project Manager for their comments. The sketch on the right shows a typical example of what is provided at this stage. Stage 5. Following approval of the sketches, I then prepared full size pencil drawings of each proposed illustrations. These contained all the intended information that will be included in the finished illustration. As with the preliminary stages, these are forwarded to the experts and Project Manager for commenting. Stage 6 is crucial due to the nature of watercolour painting techniques. As any modifications made to watercolours can effect the transparency and even damage the surface of the textured paper, it is extremely important to ensure that the details of the outline are correct. The experts are asked to analyse the content very closely and if necessary, suggest any final alterations that need to be made to the illustration. Stage 7 is the painting stage. This is again forwarded to the experts and Project Manager and any minor alterations or additions are made. Stage 8 is completion. The finished painting to the left measured 1500mm by 570mm and had to be completed in two separate sheets of watercolour paper. 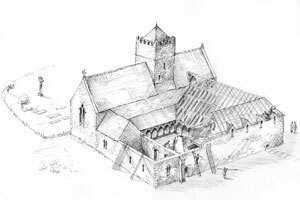 This illustration was scanned, joined digitally and is now on permanent display at Devenish Island. 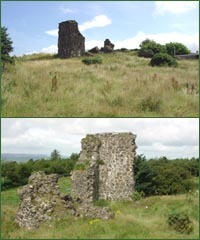 Bagenal's Castle, Newry was an unusual example - mainly due to the existence of what could be considered fairly accurate and reliable plans and elevation prepared by a 16th century engineer Robert Lythe. Even more remarkable was the fact that these drawings were sent to London and - unlike many similar documents stored in the Four Courts in Dublin that were burnt in 1922 - managed to survive destruction. starting point as I had the luxury of a set of survey drawings that were unquestionably identified as the discovered building shell in Newry. This provided an excellent and unique Features such as the stair tower, latrine tower and vaulted ceiling on the ground floor would have been purely conjectural had it not been for these drawings. As with other projects, research was carried out using the resources provided by the experts. The site visit gave me the opportunity of seeing the castle in it's present environment and viewing it from different angles to ascertain what would be the best perspective for illustrating. Other useful information regarding the position of architectural features was kindly supplied by the Environment and Heritage Service following an extensive survey of the building during exploratory work. 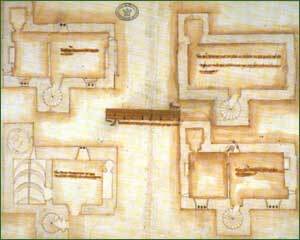 With details of furniture, dress and other aspects of 16th century living supplied by the Newry and Mourne Museum - I was able to prepare a sketch showing all levels of the castle during its period of occupation. 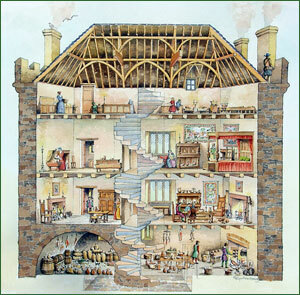 The cutaway view is an extremely useful technique for illustration as it not only shows a view into each room of a building but also shows how the rooms are related to each other and how they are accessed by hallways and stairs. 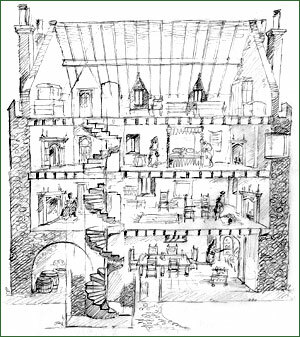 The client's original requirement was for a view into three of the main rooms in Bagenal's Castle, however the cutaway proved to be a more useful (and economical) choice. This was then sent to the experts at the Museum for their comments. The full sized pencil outline was then prepared and once the details on this were agreed by the experts, the cutaway was painted. This view shows the kitchen with the vaulted storage area on the ground floor. An interesting feature of the kitchen fireplace was the small oven at one side believed to have been used to bake bread. This oven can be seen clearly at the restored castle. The first floor probably had a reception room or hall and a parlour whereas a main bedroom or great chamber was usually located on the second floor. The attic would have provided accommodation for children, servants and may also have been used as a general storage area. Each floor would have had access by a door into a small chamber - believed to have been used as a latrine. The spiral stairway provided access to each floor and would have continued up into the battlements of the castle. In the summer of 2008 the impressive Braid Museum and Arts Centre was opened at Ballymena, Co Antrim. I was commissioned during 2007-8 by the council to provide illustrations that would initially be used in an animated display at the museum. A model was also to be included in this exhibition. 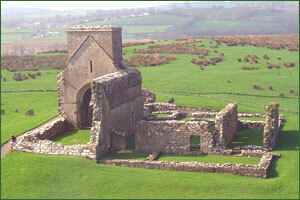 The project manager chose Clogh Castle, a site occupied from the early 13th century until the mid 17th. Only a fragment remains, the majority having been destroyed during 19th/20th century quarrying. The starting point was a report by Dr Tom McNeill – senior lecturer in archaeology at Queens University, Belfast. Dr McNeill refers to an account made in the early 19th century describing a two-part castle each part measuring 34 by 40 paces, divided by a ditch. 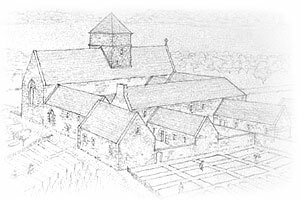 Terence Reeves-Smith of the NI Environment Agency kindly assisted me in preparing reconstructions of the castle covering the periods 1220AD, 1450AD, 1620AD and1650AD, dates relevant to the events to be illustrated. At this stage the project manager (the museum curator) was copied in on all communications between Terence and me which followed the normal procedure of initial sketch, pencil outline and finished painting. An additional criterion during the production of the paintings was to conform to a colour palette suggested by the museum designers (Ralph Appelbaum Associates, London). Fortunately my watercolour style allowed this to be easily accommodated. I then liaised with the media design company (ISO Design, Glasgow) in preparing additional assets in the form of associated sites, figures, maps and vegetation that could be used in the interactive animations. 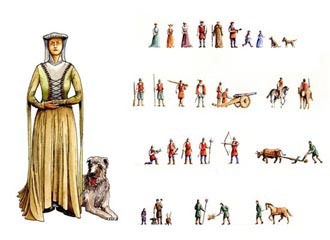 The animations outlined the history of mid Ulster through the medieval period from the Anglo-Norman conquest to the 17th century, with Clogh Castle being central to each story. Each animation only lasted a few minutes but a considerable number of individual assets were still required. I also had to prepare a number of larger figures for interactive metal rubbings for visitors. Casts were taken of the original outlines before painting and placed alongside the finished outlines to compare results! The four main reconstructions were painted 570mm wide by 380mm high. A fifth one covering the 1650 period used the 1420 illustration and involved painting some additions to the castle including the building of a larger gatehouse and simply superimposing these on to a copy of the 1420 illustration using Photoshop. 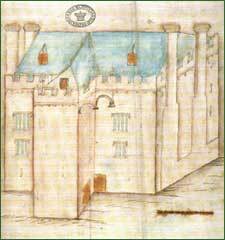 The inset shows some of the minor changes that had to be made to the original painting, such as the building of the new gatehouse, the only remaining fragment of the castle. Chimneys were also added but the cattle remained fixed to the same spot! A further task was to then describe my reconstruction of 1620AD to a model maker (Paragon Creative Ltd, York) in terms of measurements and materials. This was a challenging novelty as I had never really thought about measurements outside proportions for a perspective view however it confirmed that the proportions were very realistic and followed all the evidence on site and the early 19th c account! The reconstructions formed a basis for the model and I advised the model maker on the approximate dimensions of the castle and included a plan, elevation and details of the buildings within each of the two curtain walls.